Shot in the dark. Would you two be interested in Dublin for St. Patrick’s Day? Super cheap flights right now. Five tickets left. I phoned Husband at work. For a full two minutes, we deliberated over a trip to Ireland with Murphy and Dwight. Sometimes big decisions make themselves. We boarded our Aer Lingus flight on March 16, and it delivered us safely to Dublin early St. Patrick’s Day morning. Exiting the airport, the wind’s icy fingers clawed at me, and regret blew in. If only I had swapped out my light jacket for a big winter coat before leaving the house. And as necessary as five pairs of shoes and an extra purse were, why hadn’t I chosen a smaller suitcase? I flicked my gaze at Murphy, but she looked like she nursed only one regret: that she hadn’t left her case of bronchitis back in the States. The day was frigid, but the pubs were cozy. The public restrooms were freezing (why heat a room that’s used only briefly? ), but our hearts were warm; wearing green to celebrate Ireland with friends always staves off a chill. 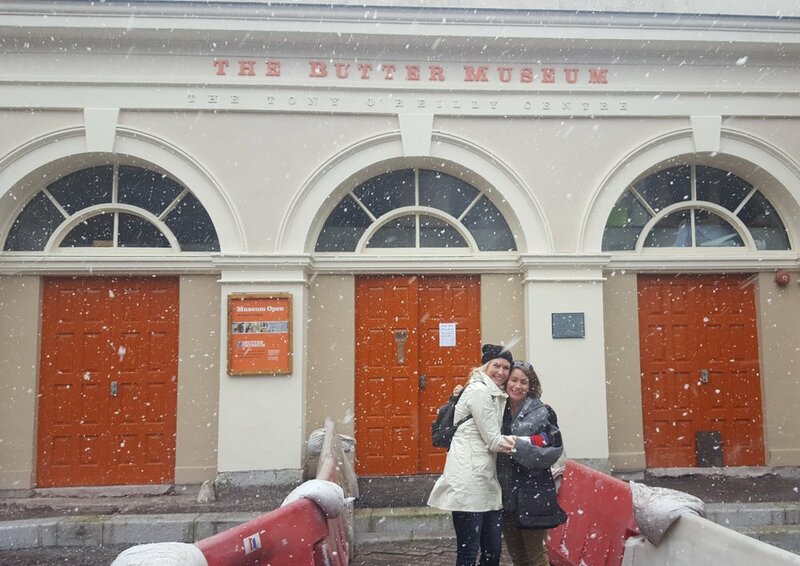 The next day, the snow fell sideways, but that didn’t stop us from visiting Cork’s Butter Museum to learn a thing or two about our beloved Kerrygold. Afterward, we arranged for a cab to take us to Blarney Castle. “How are you keeping?” the driver said as we hopped into his ride. We exchanged pleasantries, and he asked about our travel plans. “We’re heading to Athlone tomorrow,” Husband said. I smiled at the lilt of his accent, the cheery delivery of his question. Blarney Castle came into view, and my mind turned toward the magic of the stone. If the folklore was true, it wouldn’t hurt to have a little blarney in our lives. We left the cab and climbed the narrow, rugged steps of the castle all the way to the top. The attraction might be cliché, but we would kiss that rock like the rest of the tourists—or develop vertigo trying. The girth of my suitcase—and that of the rest of our luggage—may or may not have dictated the size of the rental car Husband and Dwight picked up at the airport after our two days in Cork. We heaved our belongings into the BMW’s trunk and left town, pointing the car down Highway N20 and toward more adventures. *Tune in next week for more of the story and for dining and entertainment recommendations in Ireland.